known tourist city in China. 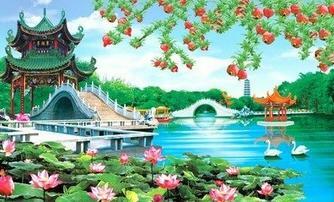 These include the Lesser West Lake, Hongqiao Bridge, the Mist and Rain Tower, the Ershisi Bridge, and Huhu Humble Cottage. The hall is inside the Tianning Temple. Marco Polo was an Italian traveller. He lived for 17 years in China and held an official position in Yangzhou for three years. On display in the memorial hall arc materials showing his life in China. A lake narrow and long to the west of Yangzhou, it extends from Hongqiao Bridge in the south to Shugang Hill in the north. It is so named because the lake is as beautiful as West Lake in Hangzhou but narrower and smaller in size. Its scenic attractions include the Greater Hongqiao Bridge, Xuyuan Garden, the Lesser Jinshan Hill, the Fishing Terrace, and Wangchun Pavilion.